Could This Be the Bottom? Editor’s Note: Join ASI’s Rich Checkan as he sits down with ECI Development to discuss the benefits of owning gold and other precious metals in ECI’s webinar next Tuesday, August 21 at 7 PM Eastern Time. In this session, Rich and ECI will explain the key factors signaling a change is coming; discuss the nearly forgotten case for owning gold and other precious metals; tell real stories about hard money doing its job: Venezuela, Zimbabwe, Iran, The Tale of the Taels, and Libyan Gold; provide two simple, safe, and effective ways to get started; and answer your questions during live Q&A. To reserve your FREE spot today, please sign up here. Gold and silver both reached record lows this week, tumbling to their lowest levels in 19 months and two years, respectively. The two metals have since rebounded in morning trading, leading some to beg the question: Have we reached the bottom? Whether or not this actually is the end of gold and silver’s eye-opening decline, there’s no denying that now is undoubtedly the best buying opportunity we’ve seen in two years. Both metals, typically safe haven assets, have surprised investors recently—especially considering the economic turmoil in Turkey and ensuing global tariffs—and there’s truly no way of knowing how long this fluke will last. Because these two metals are available at such remarkably low levels, we want to give you one last chance to benefit. For one day only, we’re offering low-premium “junk gold” $20 Liberties and $20 Saint-Gaudens for 5% over melt value per coin*. As an added bonus, if you purchase ten or more of these coins, we’ll cut your premium to 4.5% over melt value per coin* and add in FREE shipping! 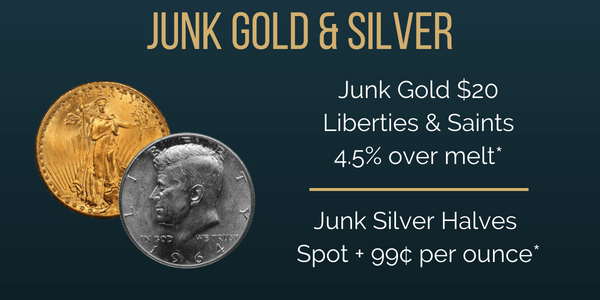 And don’t forget—the highly-demanded Walking Liberty, Franklin, and Kennedy junk silver half dollars (our choice of design) are still available at just Spot + 99¢ per ounce* for any quantity ordered! Considering half dollars usually sell at a higher premium than quarters and dimes, this is an exceptional opportunity to take advantage of both lower prices and premiums. Both of these offers expire tomorrow, and with metals prices poised so advantageously, we don’t want you to miss this opportunity! Please call us at 800-831-0007 or email us to own these exceptionally-priced junk gold coins and junk silver half dollars today. *Prices subject to change based on market fluctuation and product availability. Prices reflected are for cash, check, or bank wire. Free shipping, handling, and insurance are available for junk silver $1,000 Face Value purchases or more and junk gold $20 Liberty and $20 Saint-Gaudens purchases of ten (10) or more. Half dollar type selection is random and based on availability. Offer expires Friday, August 17, 2018, or while supplies last.